Frugal and Thankful: The magic potion. After I went home to be with my Mom, on the way back I crashed at my good friend's place overnight before my flight the next morning. We had a quick breakfast when we woke up and she shared a simple drink with me that I call "the magic potion". Why? Because with only three ingredients, this stuff is awesome! Yesterday I started feeling like I swallowed a very angry kitten, and it was trying really hard to come back out. My throat was on fire. So I decided to drink some "magic potion". I immediately felt better and slept like a baby. This "tea" is amazing, people! I have been drinking it on and off ever since I came back home, and I haven't had a cold since before the New Year. I had another cup this morning and was full of energy despite the scratchy throat. 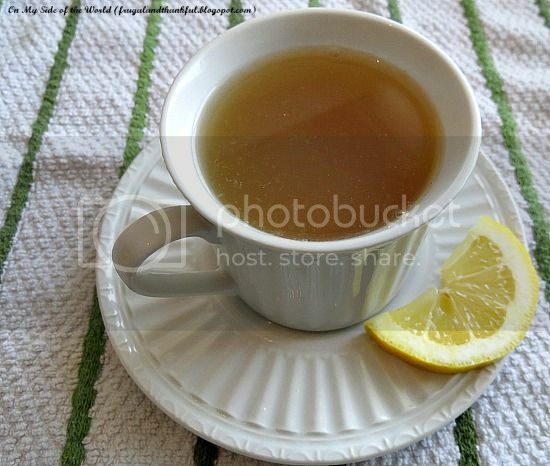 This drink is awesome to prevent or shorten colds because it's full of antioxidants and great for your immune system. The word of caution: do not add honey to the boiling water because heat destroys the nutrients in it. Use it only when a tea cooled down enough to drink it. I've shared it with many people and I thought I would tell you about it :) Maybe, somebody will find it useful :) It doesn't mean that you will never get sick but it does help you to feel better sooner and gives energy when you feel icky. Have you ever tried"the magic potion"? Thanks for sharing the magic potion recipe! You are welcome, Kathy! I hope you'll find it useful. Looks good! And healthier than drinking ginger ale soda! (Do you believe I grew up with ginger ale and didn't realize it was ginger yet it is in the name...I'm sure no nutrition though.) I hope your mom is doing well. My Mom is doing as well as to be expected. She's going through her last chemo and then will take a break for a couple of months while they will monitor her closely. She had a little set back but everything seems to be on the right path right now. Thank you for your sweet wishes! I hope she improves all the way and the next season brings her new life and hope! Yes, i go for this too. Its amazing stuff. I added turmeric for a while too but we didnt like it, even if it was doing us good. :(. Hmm, I need to try it with turmeric. That sounds interesting! I'm allergic to ginger, so no "magic potion" for me, but I LOVE my organic oil of oregano when I feel "something" coming on! It saves me each & every time!! Hope you're feeling better soon!! 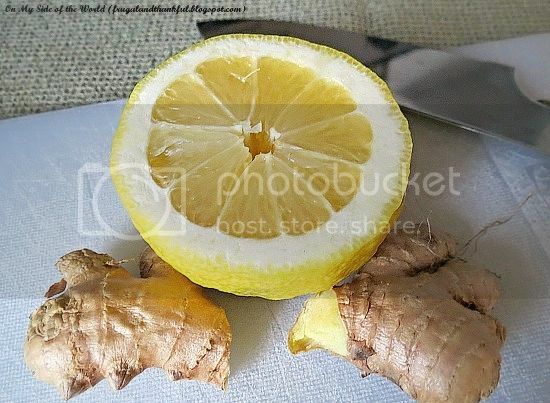 Oh, it's so sad that you are allergic to ginger! It's a super-root. And I've never tried oregano oil, need to put it on my need-to-get list. Yes actually I drink the "magic potion" 2 or 3 times a day!! It's part of the 5 day juice fast I was on and I've continued the habit. Since including ginger (and turmeric) in my daily diet I've been able to give up ibuprofin as both are very good anti-inflammatory foods and I no longer have any pain in my neck or shoulders. You bet it's MAGIC!! Oh, I hope you guys feel better soon! Ooooh that does sound good!! I bet your magic potion feels so good going down your throat! I was sucking down honey lemon tea, but the ginger would be terrific too. Thanks! You know, your magic potion is very similar to ours back home. Except we add star anise (sp?) and cinnamon to our teas. Oh, and clovers. We're all up for spices! This magic potion sounds like something I need - I got some type of cold or virus from my husband who was sick last week. It is more of a cough and throat irritation than a stuffy nose cold. Your drink would probably be great for my symptoms. Thanks for sharing - pinning. Found your magic potion recipe while reading my friend Cindy's blog Thank you cant wait to make it.